Finger Shot RPG is a new app developed by Magic Cube and available for both the iPhone and iPod touch. The game is a bit misleading with its name; while Finger Shot is definitely accurate, RPG, which stands for role playing game, doesn’t accurately match apps in this genre. When most people think of an RPG they think of a grand story and memorable characters, which Finger Shot RPG does not provide. Rather, this application is more akin to a strategy game; you select from a pool of characters and battle them against your opponent’s pool of characters. Finger Shot RPG includes 27 units that you can mix and match to create your army, with each character having unique statistics and attack patterns. Once your characters have been selected, you then engage your opponent’s characters in turn-based battle. When it is your turn, you “flick” characters across the screen; if your character hits an enemy character, it damages him. When either side runs out of characters, the battle is over. It is possible to fall off the arena as well, so each battle involves tactical planning of your characters. Each of the 27 different units are unique and have different attack patterns; this, combined with the 100 single player maps and both local and online multiplayer, gives Finger Shot RPG a large amount of replayability. As noted earlier, gamers who are interested in this iPhone app due to the RPG portion of its title should note two things: there is no story in the single player mode and none of the units have a distinct personality or dialogue. The controls are simple, responsive and effective. To “flick” a unit, you place your finger on him, pull back in the direction you want to fire and let go. An arrow on-screen shows you the direction and distance your unit will travel, ensuring that there are no misfires. However, Finger Shot RPG could do with a tutorial; the Help screen is not detailed and, on first loading the application, it can be difficult to figure out certain aspects of the app such as adding a unit to your group. 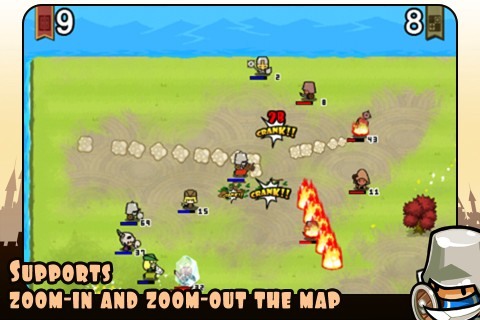 The graphics in Finger Shot RPG are bright and cartoon-like; the units are well-detailed and the graphics are displayed in a high resolution. The music is reminiscent of an anime theme song; however, only one track is used during battle so the music quickly becomes annoying and repetitive. This review was performed on an iPhone 4 with version 5.1 software and no crashes or freezing were present. Finger Shot RPG combines everything you’d want in an iPhone app: great controls, multiplayer modes and addictive gameplay. 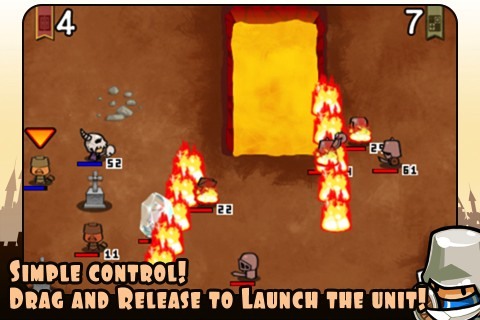 Finger Shot RPG is a recommended purchase for both casual gamers and strategy fans alike. AppSafari review of Finger Shot RPG was written by Darius Reimm on April 17th, 2012 and categorized under App Store, Games, iPad apps, RPG, Strategy, Universal. Page viewed 4994 times, 2 so far today. Need help on using these apps? Please read the Help Page.